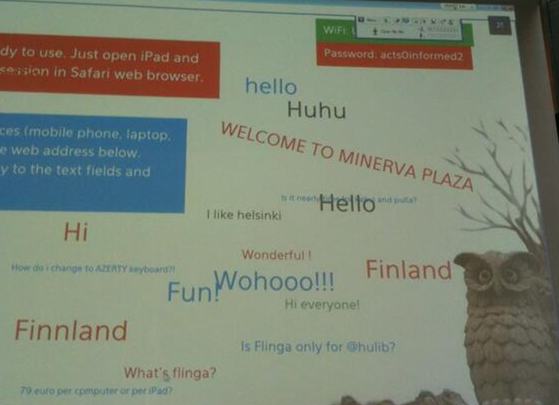 Mikko Halonen introduced us to the Minerva Plaza building, which is like a tech petting zoo! The big presentation room is called the Owl’s Nest, and it’s surrounded by smaller rooms with their own technology equipment. Time-lapse video showing how flexible the Owl’s Nest learning space can be! Some academics don’t like the glass walls of the Owl’s Nest – everyone can see what you’re doing; and some are tech refusers. No point having devices if you have no idea how to use them to teach – showing academics how is key part of Minerva Plaza. 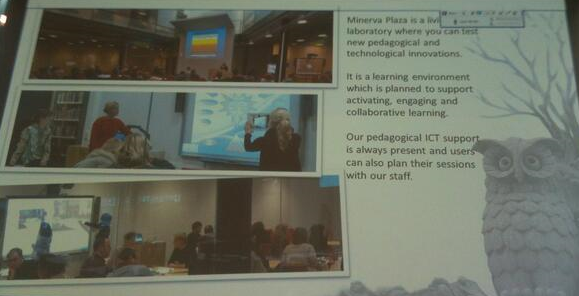 Kirsti Lonka has written about Minerva Plaza and its use – see this presentation from slide 19 and my own notes from her talk on engaging learning environments at the IFLA satellite conference on information literacy. Flinga has been valuable in encouraging discussion and engagement in conferences, as well as with students. It lets people type rather than talk. Non-native speakers of English in our group said they felt more comfortable with this. Conclusion: Flinga is a great tool to use in presentations or during courses. It combines discussing, learning and interaction!